Bring form, function and safety to your kitchen with the elegantly designed Brentwood KT-1770 glass electric kettle. 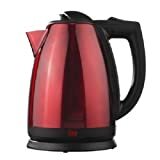 With 2-liter water capacity and 1000 watts of power, this electric kettle is faster and more efficiently than a microwave.This kettle is constructed from durable Stainless Steel with a glossy red finish. Features include a 1000-watt heating element and a locking flip-up lid and spout filter for convenience. 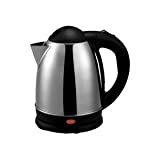 For safety purposes, this kettle is equipped with automatic shut-off, boil-dry protection, secure locking lid, power indicator light, cool-touch buttons and ergonomic stay-cool handle. For added convenience the kettle can be removed completely from the detachable base, after boiling, for cord free use. A 30-inch cord that wraps neatly into the detachable base for easy storage. 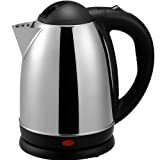 Kettle approximately measures 8.5 x 6.5 x 10 inches and comes with 1-year* limited manufacturer warranty (*from purchase date). To use the kettle, simply fill it with water up to the desired amount using the water-level indicator, and push the on switch down. This kettle heats fast and delivers boiling water that’s ready to use for coffee, tea, hot cereal, oatmeal, etc. Please refer to the instruction manual for more information. 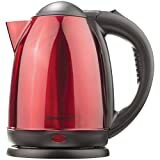 The Brentwood 1.7L Stainless Steel Cordless Electric Kettle, Red boils water faster than a microwave and safer than a stove top kettle. Water boils within minutes with a single push of a button. Cordless kettle lifts off the 360 swivel base for easy filling and pouring. Conveniently make hot tea, French press or pour over coffee, instant oatmeal and more. Always know how much water you’re using with the level indicator window. Full stainless steel interior, concealed heating element and BPA Free parts keeps water free of impurities. Includes boil dry and overheat protection for added safety. Unit automatically shuts off once water reaches a boil. The Brentwood 1.5L Stainless Steel Cordless Electric Kettle boils water faster than a microwave and safer than a stove top kettle. Water boils within minutes with a single push of a button. Cordless kettle lifts off the 360 swivel base for easy filling and pouring. Conveniently make hot tea, French press or pour over coffee, instant oatmeal and more. Full stainless steel interior, concealed heating element and BPA Free parts keeps water free of impurities. Includes boil dry and overheat protection for added safety. Unit automatically shuts off once water reaches a boil. The Brentwood 2L Stainless Steel Cordless Electric Kettle boils water faster than a microwave and safer than a stove top kettle. Water boils within minutes with a single push of a button. Cordless kettle lifts off the 360 swivel base for easy filling and pouring. Conveniently make hot tea, French press or pour over coffee, instant oatmeal and more. Full stainless steel interior, concealed heating element and BPA Free parts keeps water free of impurities. Includes boil dry and overheat protection for added safety. Unit automatically shuts off once water reaches a boil. 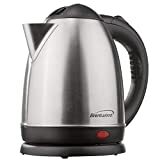 The Brentwood 1.7L Stainless Steel Cordless Electric Kettle boils water faster than a microwave and safer than a stove top kettle. Water boils within minutes with a single push of a button. Cordless kettle lifts off the 360 swivel base for easy filling and pouring. Conveniently make hot tea, French press or pour over coffee, instant oatmeal and more. Always know how much water you’re using with the level indicator window. Full stainless steel interior, concealed heating element and BPA Free parts keeps water free of impurities. Includes boil dry and overheat protection for added safety. Unit automatically shuts off once water reaches a boil.